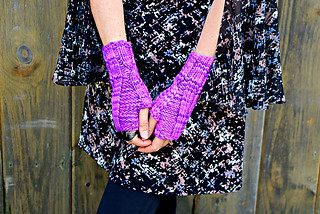 Win a Ferox Fingerless Mitts project kit! One lucky winner will receive 1 skein of Frosting Chunky yarn in their choice of hand-dyed colors and a digital copy of the Ferox fingerless gloves knitting pattern by Talitha Kuomi! To be eligible, enter your email address to receive future emails from Delicious Yarns. Already subscribe? Just enter your email address for verification purposes. Once you sign up, you can unlock bonus entries for sharing & following us on social media channels! This contest is open to yarn lovers worldwide; we'll randomly select one lucky winner to be announced on October 13, 2017. Good luck!